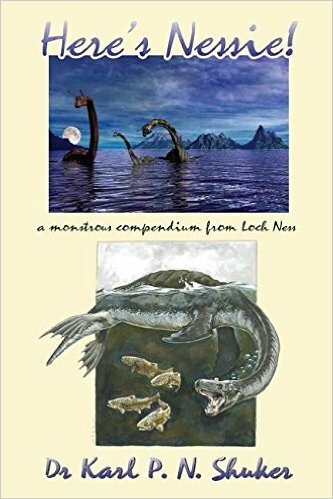 I finally finished Karl Shuker's book on Nessie entitled, "Here's Nessie: A Monstrous Compendium from Loch Ness" and review it here, but some things Karl said also merits some thoughts on that most famous of Nessie photographs, the Surgeon's Photo. Firstly, Karl has brought a lot to the cryptozoological table since the 1990s and his PhD in zoology qualifies him to speak perceptibly on various issues in the field of cryptozoology. Naturally, the Loch Ness Monster is one of those go to subjects and one that gripped the attention of Karl from his youth upwards. Now the book itself is a compendium, so what we have is an collection of Karl's shorter writings over the years addressing the issue of the monster in its zoological, cultural and folkloric aspects. In that respect, some of the material may be familiar to seasoned Nessie readers. But the main point is that his thoughts are now put down on paper. As I have emphasised before, websites do not last forever. The may end up partially archived on Internet archive websites, but paper adds a degree of permanency which I welcome. The scope of the book is wide and its depth varied as it moves from detailed analysis of cryptid theories to the lighter aspects of songs written and stamps issued in honour of this most famous of Scottish icons. The book begins in a more serious tone as it looks at the monster as plesiosaur and as long neck pinniped. The long necked seal theory was quite popular back in the 1970s as it was championed by the likes of Bernard Heuvelmans and Peter Costello. I agree with Karl's conclusions that this is an unlikely candidate for the Loch Ness Monster. There are too many cons outweighing the pros of the argument. I would add the qualifier that I would only consider it viable if the creature was somehow not a resident of the loch, but rather a visitor who breeds and feeds elsewhere. That in itself is another discussion. The modified plesiosaur also enjoys extended treatment and Karl writes well on this vexed subject. I say vexed because even if plesiosaurs survived the great Cretaceous extinction, we have no idea what they would like today after such a long time. It would be easy to add various adaptions to produce a Nessie-like plesiosaur, but a surviving plesiosaur may actually look nothing like the Loch Ness Monster. I also appreciated Karl's lookback at the 1987 symposium on the Loch Ness Monster in Edinburgh which I have read obliquely about in its published papers, but not from the perspective of an attendee. I am trying to think why I did not make this event myself. I suspect it was because I had started working and became a bit too focussed on that! Thereafter, the book tends to move towards smaller cultural articles which is probably a wise move as one is more focused at the beginning. But let us focus more on the overview of chapter one and Karl's words on the Surgeon's Photo. Karl takes a strong line in viewing the Spurling story of the hoaxed photograph as a hoax itself and bases this conclusion on various inconsistencies he sees in the narrative and which he lists in his book. Now I myself take the view, based on the balance of the pros and cons, that the Spurling account is true. I don't say that with a 100% certainty as I tend to rate Nessie pictures on a scale of probability which is purely my own personal interpretation (as everyone's will be). So in the mix of pictures that I regards as fake, real or misinterpretation, I may say a picture is 60-40 in favour of being the monster or I may say it is 70-30 in favour of being a wake or something else. That rating approach will also apply to this famous photograph. Let me now list Karl's objections in no particular order of persuasiveness. 1. There was a suspicious delay in publicising the 1975 Marmaduke article, leading to it being too late to question now deceased people. 2. The clockwork submarine with attached neck would be unstable. Karl does admit that a Japanese TV documentary crew did get a toy submarine stable, though he is not convinced of its closeness to the original setup. 3. The ripples around object show it is not moving, in distinction to the claim that the submarine was moving. 4. A 1987 study by LeBlond/Collins study of the surrounding wave patterns suggests the neck is nearer to four feet high and not the one foot that Spurling claimed. 5. The submarine theory does not explain the second photograph (below). 6. There are contradictions between the Wetherell confession and the Spurling confession. 7. Why did the hoaxers not expose the picture to the world and get their revenge on the Daily Mail? 8. The Egginton letter claimed Wilson told Egginton that the photo was a superimposition laid over an original image and not a model. 9. There is no evidence that the toy submarine was used (no photos of it or its deployment). 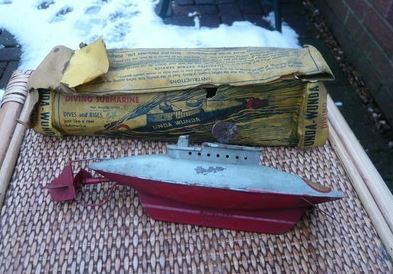 The descendants of Marmaduke Wetherell manage to produce the hippo ashtray with which he produced his infamous tracks, but they could not produce anything to do with the toy submarine. Now obviously some arguments carry less weight that others. I would not attach much weight to points 1, 4 and 7 as I can see counter explanations. Point 2 and the stability of the modified submarine was always one that could go either way for me. Spurling said he stabilised it by adding lead strips to the bottom and that is fair enough. This was basically one that needed to be retried to satisfy curiosities. I can't find a link which shows this Japanese crew trying out their submarine reproduction, if anyone can find it, post a link below. But for me, the main test is not placing this in a bathtub, but seeing how stable such an arrangement would be in choppier waters. Points 3, 6 and 8 are all variations on the theme of contradictory witness statements. Was the rigged submarine moving or not? Was it actually a manipulated photo rather than a model? Wetherell does not mention Spurling as a co-conspirator and Spurling does not mention Chambers. Wetherell says it was rubber tubing, Spurling says it was plastic wood. Now I have to say that if this was a group of eyewitnesses describing a monster sighting, the same sceptics who dismiss these contradictions would quite happily use them against any Nessie report ... because their prejudices demand they be used against the eyewitnesses. I expect nothing less from sceptics and their tactics, but should others fall for this? The answer can be "yes" or "no" depending on the case. My problem is that Ian Wetherell made his confession 41 years after the event and Spurling made his nearly 60 years after. Clearly, there is going to be a significant degree of memory recall issues after such long periods. In fact, one cannot be sure either of them is being accurate in their details. In the absence of written records or retained artifacts, I would say it is impossible to distinguish a lie from a memory defect after such a long period. That does not mean the basic story is in doubt, but rather the precise details. Point 9 has its merits as well as we do have the hippo ashtray (now resident at the Loch Ness Centre in Drumnadrochit) but we have nothing physical to prove the Wilson hoax. Wetherell claimed the sub was stepped on because a water bailiff approached the group. It seems they did not recover it. I had a curious thought at that point. Was not Alex Campbell the water bailiff at Loch Ness and so was he the supposed bailiff that interrupted the Wetherells? If so, he seems to have said nothing about it to anyone! Finally, there is point 5 and that mysterious second photograph. I know critics say the wave patterns are different between the two photos, but the point is that the Spurling theory does not predict the photo, let alone explain it. It was on one of the exposed plates, so what does it mean? To date, I have read no persuasive argument regarding it. So, do you think these nine points swing the argument towards "monster" or keep it in "hoax" territory? I have been aware of these arguments for some time, but I still weigh the pros and cons and come out about 60-40 in favour of this being a hoax. The one thing I would say is that this story has two confessors - Ian Wetherell and Christian Spurling. Any one individual can make an accusation against a photo and we have had them in this field and that is why I am cautious about accepting one single person's accusation unless there is some corroborating evidence (e.g. Richard Frere and his lone accusation against Lachlan Stuart). So we have two people on the record and, unless you believe in a conspiracy, that strengthens the case. And that is where I think I would leave this particular case. I'm in two minds here as well. I realise that there's a good reason that the people concerned would hoax this, but the concentric circular waves look like the object has just popped up, out of the water. Which would not have been the case unless someone had been holding it underwater and let go, and it popped up. But then, as you say, the stability of the assembly is in question, and if it was held underwater and allowed to pop up, it would surely rock back and forth, even if it was relatively vertically stable. The waveforms in the photo look extremely clean to me, and the picture looks as if it has been taken very quickly after emergence, if that's what happened. Circular waves like that would disapate very quickly. The only other thing I can think of is that the vertical stability was perfect (any child who played with toys in the bath would know that that particular notion would be highly unlikely for an object of this height), and the object bobbed up and down perfectly vertically, giving the photographer time to get a focus and take a shot. I don't think that is very likely, but that doesn't mean that it's not the case. It might still be a fake, but there's a lot about it that's very hard to explain in my eyes. If this object is a "model" it could have been lowered into place by something like a modified fishing rod.I think this would produce concentric ripples as it entered the water.It might also be retrieved the same way allowing it to be stepped on at the approach of the water bailiff. It does seem odd that the damaged submarine has not been produced. The second photo could have been claimed as the submarine sinking and that is the reason it could not be produced.It would seem to be a much cleaner end to the story. One wonders if the bouyancy of the hollow neck would allow the sub to sink at all. Hopkarma, when Alistair Boyd did a replication with his model for the Nova documentary he lined the model up with the opposite shore to match the original print. IIRC Adrian Shine waded out to about knee deep. The resulting photo was an extremely close match with the original. So the object wasn't all that far out from shore. That said, Richard Smith's 4' model, which was a bit further out, also came close to the original. But Smith did himself no favors by using straight pvc pipe for his mockup. Personally, I think it's a hoax. Two points in particular I find strongly point to the photo being fraudulent: 1.) In the 1975 article where Ian Whetherall discusses the hoax he mentions Maurice Chambers as the person they passed the film to. In the Loch Ness literature Chambers was R.K. Wilson's associate. This is what initially raised red flags for researcher David Martin. 2.) The orientation of the neck. I forget where I read it, but somebody pointed out that the neck looks to be set on top of the body as opposed to being connected in front of the body, which is what we would expect from an aquatic animal that is elongated in the horizontal plane and which, presumably moves thru the water primarily in the horizontal plane like other aquatic animals. When I first read this it immediately rang true. Nessie aficionados have tended to be so focused on the graceful curve of the 'neck', which it undeniably is, that the positioning/attachment on the 'body' has been ignored. Yes Paddy, found those reproductions myself and the only thing missing was a ripple pattern. The wave motions give a sense of scale, and are similar in the Surgeon's photo and Alistair Boyd's. Perspectives of photos are fairly similar. All in all, I think he nailed it. Without going out there and doing this myself, I don't know if the same effect could be produced with a longer lens and a larger, more distant head and neck. From what I can see, it's a reasonably wide angle shot, making the subject smaller than we would see with the naked eye, and appear further away. It's only a guess on my part, and we really would need to know the original camera and lens used to be able to move it from there. Professor Tuckers elasmosaurus can position itself vertically as well as horozontally. The ripples could have been caused simply by throwing a small stone in close proximity of the artefact. I think it's too perfect for that. The thing which bothers me is point 3: the fact that the object is standing still. If you wanted to use some sort of model to hoax a photo of a monster standing still, there would be absolutely no reason to use a mechanical toy submarine. Indeed, such an item would be counter-indicated. Indeed, a toy submarine of that era has no remote control. After launch it can easily be deflected by a wave and go completely off its intended course. I know - I lost one in that way as a child. I had a look at some vintage cameras from that era, and they were indeed able to fire at a shutter speed that can stop movement in a photo (of this type). The wave in particular would move quickly, but it's motion is clearly frozen. Everything is pretty sharp in the photo, although I'm guessing some of the crops have been enhanced from what I've seen. A very quick moving animal would leave a blur here, but a normal animal or submarine wouldn't I think. Unfortunately I don't think it's stillness helps us here. Unless you wanted to take a series of pics intending to show an object in the process of emerging or submerging, in which case it would seem like a workable method.